Colin Trevorrow made an impression with his previous film "Safety Not Guaranteed," an indie sci-fi dramedy, that was light on the sci-fi, heavy on the dramedy. It showed enough style and wit that someone was willing to entrust a mega franchise in his hands. That trust was not betrayed. The script, which Trevorrow had a hand in writing, feels like perhaps the most natural of the sequels to the original. It also reflects the franchise's struggle to create something audiences will be receptive to after their lackluster second and third films. The almost scary thing to think about is that Spielberg's 93 film isn't big enough or exciting enough for audiences these days. The series has felt the need to up the ante to keep moviegoers interested. If not more dinosaurs then bigger ones, and that's exactly what the now open park suggests it needs to keep attendance up. As ludicrous as it sounds, the failure of the 2nd and 3rd films suggest there's truth to the idea that we're now bored by dinosaurs. Jurassic World is the fully realized park that Hammond dreamed of. We're reminded of Jeff Goldblum's line from the first film, "if Pirates of the Caribbean breaks down, the pirates don't eat the tourists!" If Spielberg's design was inspired by Disney World, Trevorrow takes it to the next level with bits of a zoo, and SeaWorld thrown in for good measure. There's the monorail that takes guests to and from different areas of the park, the kiddie petting zoo area, and their own version of Main Street USA, and of course, the SeaWorld-esque pool housing a giant sea monster. It's a beautifully rendered world that feels like a well fleshed out amusement park. It rests on the ruins of Hammond's failed original park, and one of many callbacks to it (of which there are many, including a cameo from Mr. DNA) involves a stroll through the now overgrown main building complete with the banner that fell in front of the T-Rex toward the end of the first film. 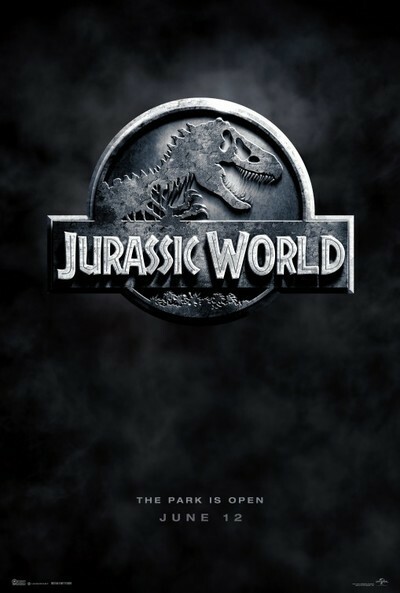 Running the show at Jurassic World is Claire (Bryce Dallas Howard), a hard working red head who reluctantly agreed to take care of her nephews for the week while their parents work through a divorce. It's obvious she's not accustomed to, or interested in being around kids, which has become a point of contention. As if to say there's something wrong with a career driven woman who doesn't have kids. However reviewers making this contention fail to mention her journey that feels somewhat reminiscent of Dr. Grant's (Sam Neill) in the first Jurassic film. She puts the boys on a tour with her assistant, and heads off to inspect their latest upcoming "attraction." A hybrid dinosaur called Indominous Rex, as big as a T-Rex and smart as a Velociraptor. Speaking of which, Owen (Chris Pratt) is on-hand as a raptor trainer. He's cautiously building a trust between the animals and himself, yet he's not sure just how far he can test that trust. Vincent D'Onofrio, who proved himself a sinister villain in the Netflix "Daredevil" series, plays the key human villain (if you can call it that) in a subplot about a military contractor attempting to recruit Owen to help him weaponize raptors for military use. To everyone else it's an obvious mistake, yet so was building such a park in the first place. To make them further question the practicality of what they do, eventually the Indominous Rex breaks out of his paddock putting the entire island at risk. And that's where the action really begins. The film has numerous shots meant to harken back to the wonder of the peaceful initial dinosaur shots in Spielberg's original, yet we came for the action sequences with park attendees desperately running from large toothed terrors. And Trevorrow doesn't disappoint. Despite his smaller indie origins, he proves capable of staging large exciting sequences that always remain coherent even at their most violent. One of the best involves a sky full of winged dinosaurs swooping down on fleeing park guests. The performances are all solid despite not requiring much of their actors. Bryce Dallas Howard's Claire and her nephew Zach (Nick Robinson) undergo the most change throughout the film, and while Chris Pratt and Jake Johnson (a co-star in Trevorrow's "Safety Not Guaranteed") occasionally add some wit and humor to break up the tension, it's perhaps not as much as was expected given their comedic backgrounds. Thankfully the special effects are spectacular. While there's obviously more CGI than in previous Jurassic films, technology has caught up to a point where it's convincing enough do so, as evidenced by last year's "Godzilla," a film that captured that Spielbergian/"Jurassic Park" mixture of excitement and terror with an overabundance of high quality, believable CGI. "Jurassic World" is an exciting adventure, that lives up to the potential of the series that started on a high note and went downhill with each new iteration.